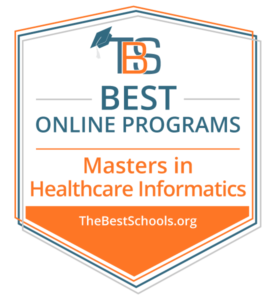 Louisiana Tech University’s online Master’s in Health Informatics degree program is ranked best in the state and No. 24 in the nation for 2019 by TheBestSchools.org, an online resource whose mission is to connect prospective students with the best online degree programs available. Tech’s Master’s in Health Informatics in the College of Applied and Natural Sciences offers several features that appeal to working professionals. The program delivers the complete coursework asynchronously through Moodle, allowing students to access lectures at their convenience while working full time. Students never need to visit campus to earn their degree, and all online students pay only in-state tuition. The program’s curriculum consists of 45 credits, including foundational courses, such as database architecture, clinical information systems, and computerized decision support. The curriculum concludes with a capstone research project. In many cases, students can fold these projects into research opportunities in line with the expertise and pursuits of faculty members in the Department of Health Informatics and Information Management. The Commission on Accreditation for Health Informatics and Information Management (CAHIIM) has accredited the program at Tech. To determine the rankings, TheBestSchools.org, an independent organization of educators and administrators, looked at the most important factors that concern prospective students, mainly common predictors of future success and a school’s commitment to online programs. The main targets for consideration are admissions rate, student loan default rate, retention rate, graduation rate, and the percent of students enrolled in online classes.